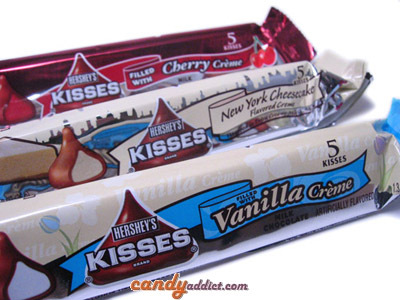 You may have noticed that we here at Candy Addict go a little nuts over the Hersheyâ€™s Limited Edition Kisses. Well, a good friend of mine recently went to Hawaii, and she brought back a bag of the Hersheyâ€™s Kisses with Macadamia Nuts. I havenâ€™t quite figured out if these are limited edition or simply limited to sales in Hawaii. 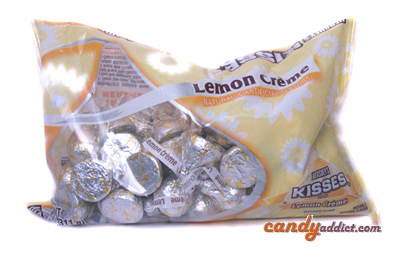 These Kisses feature Mauna Loa macadamia nuts (Hersheyâ€™s acquired Mauna Loa in 2004) and were first introduced in Hawaii in 2006. Thereâ€™s a milk chocolate and dark chocolate version. Happily, I got the milk chocolate version! Okay, hereâ€™s where I fess up that I am not a huge lover of macadamia nuts. Given a choice, I would generally select a non-nut version of a candy, but if I have no choice? Bring on the macadamia nuts! Now, in my favor, these Hersheyâ€™s Kisses with Macadamia Nuts donâ€™t boast a strong nutty taste. You might think these Kisses would have a whole nut in the center, but then you would be wrong! These milk chocolate Kisses have teeny little chunks of macadamia nut in them. They are so minuscule, in fact, that they are practically negligible. I do think, however, that thereâ€™s a hint of macadamia nut in there that lends a subtle, nutty flavor to the creamy milk chocolate. So, these might not knock your socks off if youâ€™re a big fan of macadamia nuts, but they are still tasty and will appeal to a large audience. 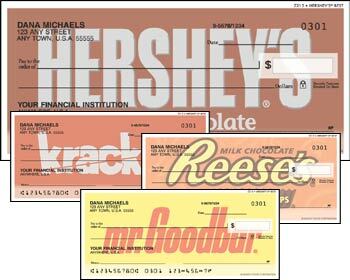 Check It Out: Candy Bar Checks! I’m always excited to see a new version of Hershey’s Kisses using white chocolate since I’m a huge fan of the stuff. I remember when Hugs first premiered back during my childhood and I was so excited to have white chocolate stripes in Kiss form. I couldn’t wait to try them. Had I known Hershey’s would continue to roll out new flavors of white chocolate Kisses, well, it would have made me one impatient little girl. I haven’t been as exited about white chocolate Kisses since the Strawberry Creme flavor way back last year. The Orange creme, Candy Corn, Caramel creme, Confetti, Toffee Crunch all left much to be desired and the flavor variety was kinda ho-hum. I have high hopes for these since I’ve had lemon white chocolate before in sundry bonbons and gourmet bars before and it was just a heavenly combination. I was fully confident that Hershey could successfully pull off this simple, yet sophisticated flavor combination in a Kiss quite easily. Am I the only one who is having a hard time realizing it’s December already? It seems the year will be over before we know it! Actually, now that I think about it, I know I’m not alone. I believe Hershey’s knows that the year of the 100th anniversary of Kisses is soon to end and they’re cranking out some new ones to show it! 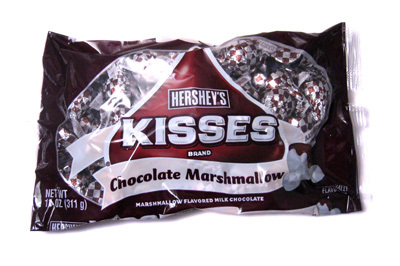 Enter the new Malt and Chocolate Marshmallow Hershey’s Kisses. I can tell these aren’t made to be associated with the other “holiday” flavors of Kisses because these lack the seasonally decorated packaging. It’s pretty sweet to think that they’re still making these Limited Editions separate from the holiday candies. Many would call that good marketing. Regardless, I’m here to give these newbies a taste!